Apnea is common in premature infants, who often lack the neurological and muscular development to breathe correctly on their own. Nearly half of 12 million premature babies born in developing countries experience apneic episodes; cost, power, and personnel constraints in these settings motivated a desire to tackle this problem at a ward-based level, easing the burden on overworked healthcare professionals and providing long-term patient respiratory data to doctors. 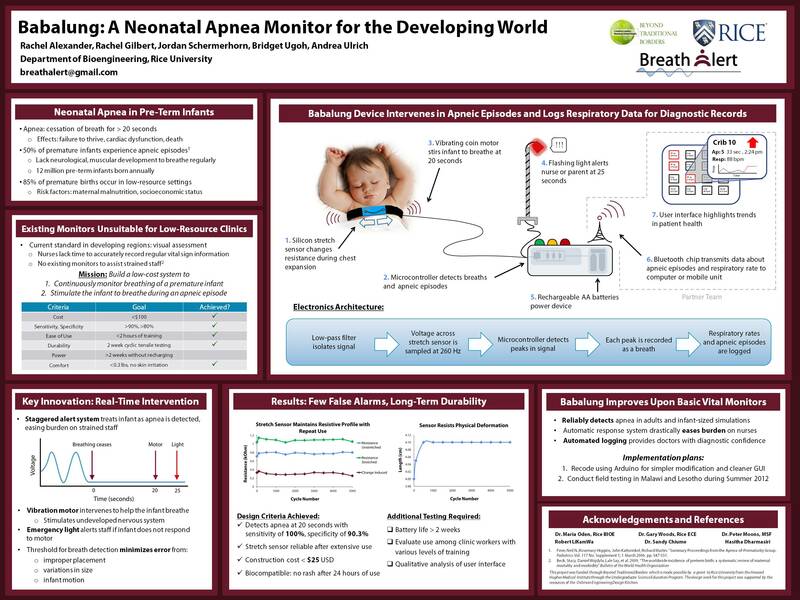 To solve this problem, Team Breath Alert has developed a low-cost, robust sensor to reliably detect respiratory rate of premature infants and monitor for apneic instances. Maternal malnutrition is a major risk factor for premature delivery, and infants most at risk for apnea of prematurity – those in the developing world – are those who go most frequently unmonitored. Apnea monitors used in hospitals the United States are power-intensive and extraordinarily expensive, leaving primary health care centers in the developing world relying on nurses to keep vigil. These episodes frequently go undetected, as current diagnosis relies on constant observation - impossible in busy wards with such tremendously low nurse-to-patient ratios. We have constructed a durable prototype capable of detecting apnea in premature infants for roughly $35, without reliance on a constant power supply. Our device consists of size-adjustable strap with a stretch sensor; an attached microcontroller contains position-calibrating software to track breaths, turn on a vibrating motor at 20 seconds without breathing, and to alert a nearby healthcare professional with a flashing light if breathing does not resume within 5 additional seconds. Our electronics also provide compatible docking with a system developed by a second senior design team to transmit information about patient health and apneic episodes to a central station (computer or smartphone) via low-power Bluetooth 4.0. The modification central to our monitor is an automated treatment response to irregular breathing. Respiratory distress in premature infants usually results from neurological underdevelopment; our light vibration system activates a more conscious response, comparable to the current treatment of having a nurse tap the foot. The combination of diagnosis, treatment, and data collection saves lives while conserving the valuable time of nursing staffs strained far beyond capacity. Additionally, giving nurses the ability to identify infants in respiratory distress allows for patient triage, and logging respiratory rate automatically allows doctors and nurses to track a patient's growth and disease progress over time. 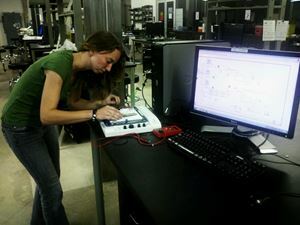 At present, we are preparing to take our device abroad for field testing in Malawi and Lesotho this summer. Last updated 5/1/2012.